We’ve lived in the UK (and briefly in Germany) for almost twenty years now. We both grew up in hotter places, so we’re really looking forward to the climate of the Aegean coast. Hıdırbeyli is at 37.9 degrees north, and, like much of south-west Turkey, is in the Köppen climate zone “Csa”, i.e., dry-summer sub-tropical, or Mediterranean. Sounds good! I was curious to see what cities 37.9 degrees puts us level with. Around the Mediterranean, it’s great to see that we’re on the same latitude line as places like Athens, Palermo, and Cordoba. Further afield, the results are a bit more surprising. In the US, we’re about level with Richmond (Virginia) and San Francisco. In east Asia, we’re lined up with Seoul and Fukushima. 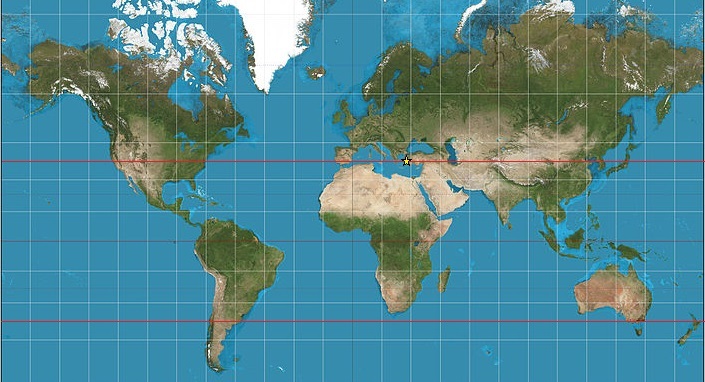 World map showing 37.9 degrees north and south. Map borrowed from Wikimedia Commons. What if you flip things around to the southern hemisphere? Strange to note that in Africa there’s no land that far south. We’d be in the sea off Cape Town. In South America we’re level with the Argentinian beach resort of Mar del Plata; in Australia we line up with Melbourne; and in New Zealand we’d be midway between Auckland and Wellington. Thanks, Phil. We’re just into the light orange 15-20 degree band, I think.